THE HIGHEST QUALITY MEAL BAG YOU CAN BUY: ISOBAG® We claim that the ISOBAG® is the world's best meal management cooler & we mean it! We use only Prop 65 compliant materials, top quality YKK Zippers, heavy insulation & top of the line chilling ISOBRICKSTM that go in a "out of the way" pocket in the main compartment & it's hand assembled in the USA! The 3 meal ISOBAG® is the ULTIMATE meal management bag! Durable and highly versatile, fitting 3 -38oz. containers or 4 or more -28oz or smaller containers makes your ISOBAG® a reflection of your personal diet needs. Our bag is approx. 40% smaller & lighter and can hold more food than our competitor's. Our 3 meal ISOBAG® weighs 2.5lbs empty, while our foreign made competitor's 3 meal weighs 5lbs... EMPTY. Our 3 meal ISOBAG® measures 14" x 9" x 8" and the competitors 17.5" x 9.5" x 9.5". Our bag allows you to pack more meals for a fraction of the weight, size and price! Your ISOBAG® also comes with double the amount of containers, providing additional convenience to your meal system. The ISOBAG® features a easy access front loading compartment that stores our stackable food containers, 2 insulated side pockets and 2 outside mesh pockets for quick access nonperishable items such additional bottles, phone, keys & headphones. The top of our bag features an additional nonperishable storage compartment good for protein bars, vitamins/supplements, utensils and much more! The ISOBAG® also includes a padded shoulder strap, maximizing the comfort of carrying your bag. Isolator Fitness is a company committed to helping you achieve your goals by providing as much convenience as possible and by adding a harness and sidekick bag to your meal management system you can convert your system into a backpack! Each one of our bags comes with a lifetime warranty on our American made zippers & stitching, valid upon registration. Isolator Fitness is highly recognized in the fitness industry for the quality and durability of their products. STACKABLE REUSABLE MEAL PREP CONTAINERS INCLUDED: 6 leak resistant, BPA free, microwave safe, dishwasher safe, freezable, stackable and recyclable food containers are included! 4 sizes for your personal dietary needs (3) 16oz, (1) 12oz, (1) 28oz, and (1) 38 oz. The 3 Meal ISOBAG® will fit up to 3 -38oz. containers or 4 or more -28oz or smaller containers for perfect portion control. Additional black and color containers available for purchase for around $2 a piece, making food prep a breeze! MADE IN THE USA! 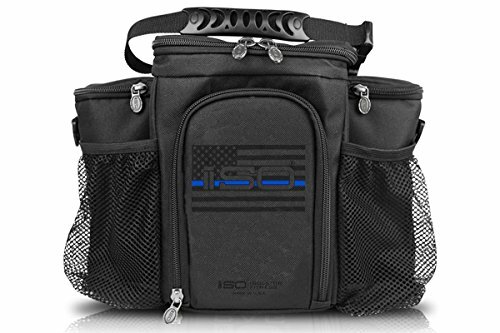 This lunch box is hand assembled in Reading, PA It weighs 3.5 lbs(no food) & measures 14" x 9" x 8" A padded shoulder strap & molded handle maximizes comfort. Also includes 2 leak proof ice bricks that go in a "out of the way" pocket in the main compartment. Has a lifetime warranty on our American made zippers & stitching w/registration. Isolator Fitness is recognized for the quality & durability of their products. Not having to replace your bag every year is a huge value!